Our organization is known in the industry for offering clients a superior quality. Our range of Continuous Emission Monitoring Systems is manufactured using latest technology components and superior quality raw material. The Uniphos CEMS is an online analyser for measuring concentration of various toxic gases in industrial process/ boiler stack. The Agasthya Series BI 7000 IR Continuous Emission Monitoring System is designed to meet the needs of organizations requiring reliable multiple gas analyzer solutions that meet international standards. The technology employed are all tried and tested to ensure the user experiences maximum reliability and accuracy. 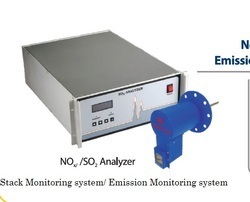 Stack Gas Analyzer System For Continuous Monitoring. Electro- Chemical Sensor Based Analyzer. SO2 : 0 TO 5000 PPM. NOX : 0 TO 5000 PPM.